We were thrilled when Casey and Thomas asked us to capture their wedding day. This super couple opted to meet for a first look and have their wedding photographs prior to the ceremony and I am so glad they did as it made their whole day relaxed and absolutely suited this laid back couple- allowing them to head straight into their reception after the ceremony! 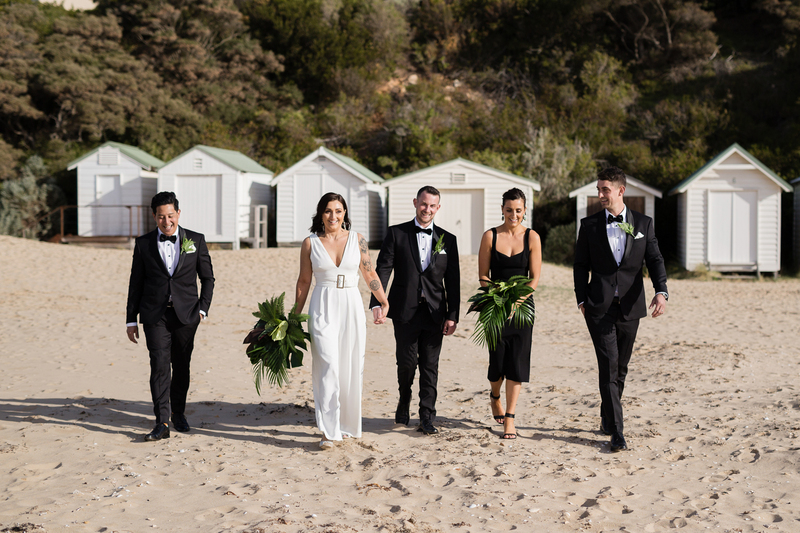 We meet Thomas and his groomsmen at a gorgeous private beach for a few pictures before Casey arrived looking stunning and uber chic in a white jumpsuit! When Thomas turned around to see Casey at the first look – he could not take his eyes off her! After a few minutes and a few happy tears we photographed these two and their bridal party and their gorgeous son Hendrix before heading to All Smiles for the ceremony. With close friend Kat Sillars officiating their ceremony- there were so many laugh and many emotional moments. Afterwards we escaped the wind and headed inside to celebrate the night away. Thank you for having us capture your day Casey and Thomas- we had so much fun!! Shannon and Christine.